It was here, on April 9, 1965, that General Robert E. Lee of the Confederacy surrendered his forces to General Ulysses S. Grant of the Union, bringing an end to the bloodiest conflict in the history of the United States. The war had begun in 1861, and in four terrible years more than 618,000 soldiers died. It wasn't until General Grant had chased Lee's exhausted and ill-supplied troops to Appomattox Court House, however, that the war was effectively over. Appomattox Court House is actually the name of the village, not a particular building. On the evening of April 8, 1865, the remnants of the once-proud Confederate Army of Northern Virginia arrived on the outskirts of the village, with Grant's Union army right on its heels. Lee was hoping to obtain much-needed supplies for his troops at a railway siding, but he didn't realize that Union troops had just beat him there. Skirmishes began at 2:00 a.m. on the 9th, and by late morning Lee realized he had grossly underestimated the number of Union troops he faced. Grant had forced-marched over three battalions to meet Lee at Appomattox, and it was these troops that a dispirited Lee found himself facing. With no supplies, the enemy surrounding him on three sides, and the only route of escape to the northwest which was pure Union territory, Lee had no choice. At 11:00 a.m. he put out a white flag of truce. Approximately 500 men died in the skirmishes during these two days. The details of the truce that was arranged are remarkable in their civility. Members of Lee's officer's group chose Wilmer McLean's house as an appropriate meeting place, and it was there that Lee and Grant met. Grant was too embarrassed to bring the conversation to a head, so it was left to Lee to ask him for terms of surrender. Grant allowed all Confederate soldiers to return to their homes, as long as artillery and weapons were relinquished. Lee signed it, then realized that the soldiers' horses were not accounted for. The Confederate men would need them for farming. Grant would not change the already-signed agreement, but he did instruct his men to allow any Confederate soldier claiming a horse or a mule as his own to keep it. Grant also ordered that 25,000 rations be immediately delivered to Lee's hungry men. Although Lee's army was not the last Confederate army to surrender (three more would come to terms with the Union over the next few months), this marked the end of major conflict of the War. Twenty-seven buildings survive from the 19th century, including the McLean House where the truce was signed. Visitors can tour the McLean House hourly with rangers, or explore it on their own. The visitors center is located nearby, in the restored Courthouse. Living History reenactments are offered daily during the summer months, and occasionally during the off-season. There is also a 70-seat theatre that offers two different 15-minute slideshows during the day. Visitors can take a self-guided tour, walk a six-mile history trail, and enjoy daily Ranger talks in the summer on the rolling undisturbed Virginia lands. The 1800 acres of the Site also include the burial ground of Joel Sweeney, who helped popularize the five-string banjo. Visitors can see the home of Charles Sweeney, his cousin. From Richmond, take US 60 west for approximately 60 miles west to the junction with state highway 24. Take highway 24 southwest for about 16 miles; the Site will be on your left. Continue on an additional two miles to the town of Appomattox. About 55 miles to the west southwest is the Booker T. Washington National Monument. 50 miles to the north is Shenandoah National Park. 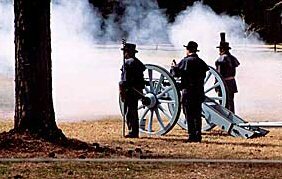 About 90 miles to the northeast is the Fredericksburg and Spotsylvania County Battlefields Memorial National Military Park.